Do you need to enhance the curb appeal of your home? If yes, Carroll Awning Company is here to help you every step of the way with our retractable awnings. Retractable awnings can provide your home the added function and elegance it needs to outshine not only the homes in your neighborhood but also homes on the market. Why are retractable awnings so popular for residential remodeling? The answer is that it provides exceptional flexibility in functionality and style. At Carroll Awning Company we have a wide assortment of fabrics, colors and patterns for you to choose from. If you want a creative retractable awning design consider using white, almond or bronze aluminum awning frames. The colors complement just about any home design and look absolutely amazing on decks and patios alike. Every awning produced at Carroll Awning Company is custom made with your dream and vision in mind. Size and style make for the perfect fit for any home entry, deck, patio and more. Get the shade and protection you need and want for your home, family and friends today! Our residential awnings are guaranteed to provide a lasting performance. Check out Carroll Awning Company’s Retractable Awnings today – Sunesta Premium, Sunstyle Deluxe, Sunlight Classic, Sunflair Economy, Sundrop and Sunbrero! 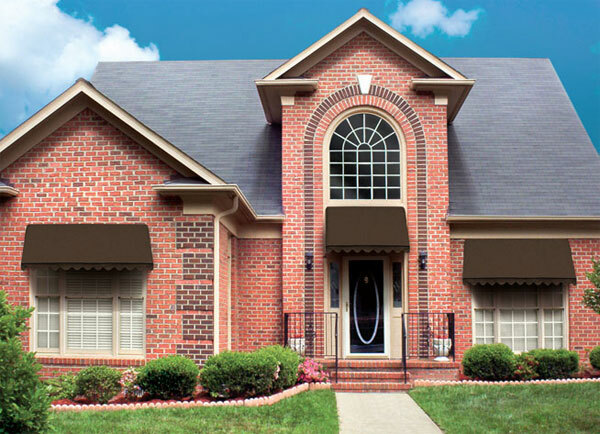 For more information on residential awnings (as well as a free quotation) call Carroll Awning at 1-800-999-5617 or click here today!